By Peter Anderson Leave a Comment - The content of this website often contains affiliate links and I may be compensated if you buy through those links (at no cost to you!). Learn more about how we make money. Last edited January 25, 2013 . A short while ago the IRS released their 2013 IRA contribution limits, income based phaseouts for deductions as well as guidance on what we can expect to see changing this year with Roth and Traditional IRAs. If you have an IRA it's a good idea to keep tabs on the changes from year to year so that you can take advantage of any increases in contribution limits, or to make sure you're not making too much to contribute. Get a big raise this year? You might not be eligible to contribute to your Roth IRA this year, so make sure to check! 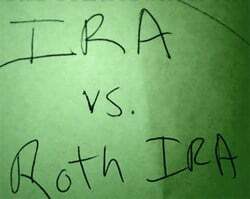 The contribution limit for both Roth and Traditional IRAs went up this year by $500. So if you're under the age of 50 that means you can now contribute $5,500 to your IRA accounts. Older than 50? You can make catch up contributions of up to $1,000 – which means your limit is actually $6,500. Here’s a table showing the 2013 Traditional and Roth IRA contribution limits, along with the limits in years past. For Roth IRAs single taxpayers with an annual Modified Adjusted Gross Income (MAGI) over $112,000 begin to see their allowable deduction drop until at $127,000 it goes away completely. The limits for Married Filing Jointly investors are $178,000-$188,000. For Traditional IRAs single taxpayers with an annual Modified Adjusted Gross Income (MAGI) over $59,000 begin to see their allowed deduction drop until at $69,000 it goes away completely. The limits for Married Filing Jointly investors are $95,000-$115,000. In fact, you can still open a Roth IRA or a traditional IRA and contribute the fully allowed amount up until tax day. Tax day will fall on Monday, April 15th, 2013 this year. So there is still plenty of time! If you do make a contribution in 2013 before tax day, make sure you specify which tax year the contribution is being made for. Also keep an eye out so that you can make sure to increase your contributions in years, like this one, where the contribution limits increase. Are you increasing your contributions this coming year? Last Edited: 25th January 2013 The content of biblemoneymatters.com is for general information purposes only and does not constitute professional advice. Visitors to biblemoneymatters.com should not act upon the content or information without first seeking appropriate professional advice. In accordance with the latest FTC guidelines, we declare that we have a financial relationship with every company mentioned on this site.